Background: Anxiety disorders are one of the most common psychiatric disorders existing in the population. The association between stress and platelet activity has been envisaged by the researchers. Mean platelet volume (MPV) is considered as the marker and determinant of platelet function. Objective: To evaluate the MPV in anxiety disorder and to check for the association of MPV with severity of anxiety. Method: This was a hospital-based, descriptive, cross-sectional case-control study. One hundred and fourteen consecutive anxiety disorder patients were included in the study. Age and gender matched 70 subjects were taken as controls. 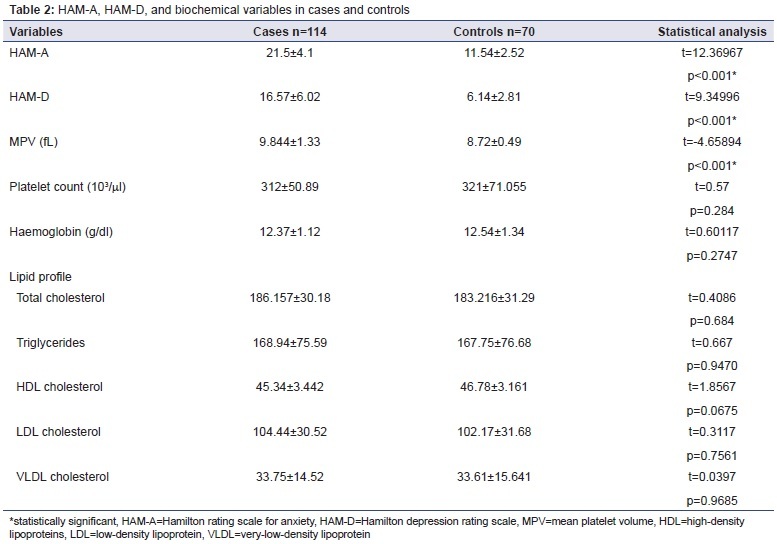 The Hamilton rating scale for anxiety (HAM-A) and the Hamilton rating scale for depression (HAM-D) were assessed and complete blood count, MPV, and lipid profile were measured for all the subjects. Results: MPV values were more in anxiety disorder (9.844±1.33) than in controls (8.72±0.49) and this difference was statistically significant (p<0.001). There was negative correlation between MPV and platelet count, and there was a positive correlation between HAM-A scores and MPV. Conclusion: Increased MPV is associated with anxiety disorder. Future research should be planned to investigate the effect of MPV, anxiety disorder on cardiovascular diseases and the effect of anxiety treatment on MPV. Keywords: Stress. Platelet Function. Cardiovascular Diseases. Anxiety disorders are among the most common class of mental disorders present in the general population. The estimated lifetime prevalence of anxiety disorder is more than 15%, while the 12-month prevalence is over ten per cent. Serotonin (5-hydroxytryptamine [5-HT]) is well-established neurotransmitter in the central nervous system (CNS). It plays a key role in anxiety disorder, depression, platelet aggregation, and regulation of vascular tone. Researchers have recorded that a hyper-serotonergic state resulting from impaired serotonin transporter (5-HTT) function can cause an anxiety or fear response by stimulating the amygdala. Several 5-HTT abnormalities have been detected in anxiety disorder, although results concerning the synaptic serotonin state are still disconsonant. [4,5] Platelet uptake of serotonin from the plasma is dependent on 5-HTT which has a role in neurotransmitter reuptake in CNS and is also essential to the platelet plasma membrane. Scientists have promulgated, platelet activity is amplified by emotional stress and hypothesised that the actions of stressors on platelets may be a primary trigger in coronary events such as myocardial infarction (MI). Mean platelet volume (MPV) is a good guide of platelet activity and is a measure of platelet size. Increased MPV is considered to be closely linked with cardiovascular diseases (CVDs), like acute MI, ischaemic heart diseases, congestive heart failure, and a close affiliation exists between CVDs and anxiety disorders. [8,9] However, there are only few studies which have reported a relationship between MPV and anxiety disorder in the literature. As CNS is challenging to access, peripheral platelet models are usually used as pointers of central 5-HT metabolism; moreover, they are known to reflect central serotonergic function. The objective of the study is to assess MPV in anxiety disorder and to check for the association of MPV with severity of anxiety. This was a hospital-based, descriptive, cross-sectional case-control study, conducted in the outpatient department (OPD) of Psychiatry of The Oxford Medical College, Hospital and Research Centre (TOMCH&RC) in the year 2016 for duration of three months. One hundred and fourteen consecutive patients in the age group of 18-65 years who were diagnosed to have anxiety disorder according to the fifth edition of the Diagnostic and Statistical Manual of Mental Disorders (DSM-5) criteria were included in the study. Age and gender matched 70 subjects who were hospital employees or relatives of the patients and did not have any psychiatric disease were taken as controls. Subjects who had seizure disorders, mental retardation, other psychiatric disorders, hypertension, hypercholesterolaemia, acute or chronic physical illnesses, pregnancy, or a history of any drug use during the last month, smoking and alcohol use were excluded from the study. Written informed consent was taken from the cases and controls. They were administered a semi-structured proforma to collect sociodemographic details, height, body weight; the Hamilton rating scale for anxiety (HAM-A) and the Hamilton rating scale for depression (HAM-D) were assessed by the psychiatrist in OPD. Complete blood count (CBC), MPV, and lipid profile were measured and recorded for each subject. The study was approved by the institutional ethics committee of TOMCH&RC. HAM-A is one of the instruments frequently used to evaluate anxiety. It is a screening tool for anxiety symptoms with 14 items. Each item is rated on a zero to four scale. Patients who had the score above 14 have the risk for anxiety. Score above 14 is considered as clinical anxiety present. Score below 14 no anxiety, 14-17 mild anxiety, 18-24 moderate anxiety, and 25-30 severe anxiety. HAM-D has 21 items and is an observer rated screening tool. Ratings are made on the basis of clinical interview. Scores of seven and below is considered as normal, eight to 13 as mild depression,14-18 as moderate depression, 19-22 as severe depression, and 23 and above as very severe depression. Five ml of blood was obtained from medial cubital vein by venepuncture avoiding haemolysis. Following a 12-hour fasting period, from each subject, blood samples were drawn. The first two ml venous blood was collected in sterile BD vacutainer tube with 5.4 mg of K2 ethylene diaminetetraacetic acid (EDTA) from BD Franklin Lakes NJ USA. CBC, including MPV, were determined using Sysmex XP-100: A1489 haematology analyser (Sysmex, India). In order to measure MPV reliably and to minimise the potential influence of anticoagulant (EDTA), blood samples were analysed within 60 minutes after venepuncture. MPV and platelet count were measured for all subjects. The reference range for MPV was between 6.9-10.8 fL. Remaining three ml of blood samples was collected in gel vacutainer. Samples were centrifuged after 30 minutes at 3000 rpm for ten minutes. All the analysis was carried on serum samples. Serum cholesterol was measured by CHOD-PAP method,[13,14] triglycerides by GPO-PAP method, high-density lipoproteins (HDL) by phosphotungstic acid method, and low-density lipoprotein (LDL) cholesterol (LDL-C), very-low-density lipoprotein (VLDL) cholesterol (VLDL-C) were calculated by using Friedwald’s equations. All the blood samples were analysed at the same laboratory. The data was analysed using SPSS for Windows version 16.0 software (SPSS Icn Chicago, IL, USA). Data were tested for normal distribution using Kolmogorov-Smirnov test. Results obtained were analysed using descriptive and inferential statistical methods. Chi-square test was used for categorical data and student t-test, analysis of variance (ANOVA) was used for continuous data. Logistic regression was used to identify the relationship between anxiety disorder and MPV. Pearson’s correlation was used to know the association of MPV, platelet count, and anxiety scores. There was no statistical difference in the sociodemographic details and body mass index (BMI) of the cases and the controls (Table 1). Among the 114 cases of anxiety disorder, 58% were generalized anxiety disorder (GAD), 26% were panic disorder (PD), and 16% were social anxiety disorder (SAD). HAM-A and HAM-D mean scores were higher in cases than controls and this difference was statistically significant (Table 2). There was no statistically significant difference in the lipid profiles and haemoglobin levels between the groups. MPV was more in anxiety disorder (9.844±1.33) than in controls (8.72±0.49) and this difference was statistically significant (p<0.001) (Table 2). When we compared MPV within the group, the value in SAD (10.98±1.42) was more than GAD (9.345±1.5) and PD (9.2±0.86), and this difference was statistically significant (p<0.05) (Table 3). When we compared MPV and platelet count with different grading of anxiety according to HAM-A in cases, there was no statistical difference in MPV and platelet count (Table 4). 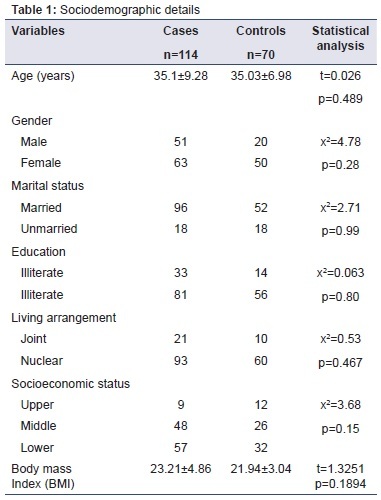 There was no statistical difference in MPV values between male (10.11±1.57) and female (9.76±1.27) cases (Table 5). There was negative correlation between MPV and platelet count (r value was -0.057) and there was a positive correlation between HAM-A scores and MPV (r value was +0.235) (Table 6). The odds of anxiety disorder was greater (odds ratio [OR]=4.123, p<0.001, confidence interval [CI]=2.472-6.876) with increasing MPV. Platelets express 5-HT2A receptors and 5-HTT identical to those present in the brain; so, it has been used in psychiatry as a peripheral model of serotonergic system. It has been observed that platelet size, measured as MPV, correlates with platelets reactivity. Three criteria have been speculated as determinants of platelet volume: age dependent course that can alter platelet size in circulation, diversity and maturity of bone marrow megakaryocyte population, and peripheral size-related sequestration of platelets. There is affirmation that to a great extent MPV is determined during the time of megakaryocyte fragmentation into platelets. In the aetiology of mortality in CVDs, depression and anxiety disorders are one of the important factors. Increased anxiety levels have been associated with higher risk for stroke independent of other risk factors. It has been suggested that platelet activity is influenced by emotional stress and that coronary events such as MI may be provoked by these stressors. In one study, it was observed that the presence of anxiety symptoms is associated with higher platelet reactivity in stable CVD patients and authors have also suggested that anxiety may be a better predictor of platelet reactivity than depression in patients with CVD. Contrary to our findings, Göğçegöz Gül et al. found lower MPV levels in PD patients compared to the control group. The authors postulated that abnormal serotonin metabolism, such as changes in the functional state of serotonin receptors in platelets of PD patients can cause decreased MPV in PD patients. But, they could not give exact reason for the decreased MPV. As a vast number of studies have reported increased MPV in patients with major depression, we believe that increased MPV levels can be expected in anxiety patients. In the current study, there was a negative correlation between MPV and platelet count. It has been previously reported that larger platelets have a greater mass, denser granules, and are more active than smaller platelets, enzymatically and metabolically. They have a greater thrombotic potential caused by higher levels of intracellular thromboxane A2 and also express more pro-coagulant surface proteins such as P-selectin and Gp IIb/IIIa. Additionally, larger platelets aggregate more rapidly than smaller platelets. Increase in platelet volume are often associated with decrease in platelet count perhaps as a result of small platelets being consumed in order to maintain a constant platelet functional mass. In our study, we observed positive correlation between MPV and HAM-A score; this shows that as the anxiety score increases the MPV values increases. There is a paucity of literature with regard to this. Gender related differences in platelet activity have been reported previously. We found that MPV levels of male patients were higher than those of female patients; but, there was no statistically significant difference. Male and female patients had higher MPV than the controls and this difference was statistically significant. These findings may contribute to the independent association of MPV levels with anxiety disorder. In our study, we observed that MPV was higher compared to controls and when the comparison was made within the group, it was observed that MPV was higher in SAD than GAD and PD, and this difference was statistically significant. To the best of our knowledge, this is the first study in India to examine the relationship of MPV and anxiety disorder. The other studies done previously have not used scales to measure the severity of the anxiety symptoms and they could not correlate the severity of the disorder and the MPV, and had quoted as the limitation in their studies. Our analysis did not include individuals with conditions such as hypertension, coronary artery disease, diabetes mellitus, malignancy, dyslipidaemia, stroke, drug use, smoking and alcohol abuse which are known to affect platelet activity. Despite the strengths of the study, there were certain limitations. As it is a hospital-based case-control study with small sample size, it could not be generalised to community. This study was a single centre study and not a multicentre study. Subclinical inflammation and pre-hypertensive state in the study subjects were not assessed and this can have influence on the MPV. Even though to reduce the influence of anticoagulant (EDTA), blood samples were analysed within 60 minutes after venepuncture, it still can have effect on MPV measures. To conclude, increased MPV is associated with anxiety disorder. There was a positive correlation between MPV and severity of anxiety symptoms. Further research for the estimation of MPV as a tool for neuropsychiatry and psychopharmacology to examine how certain mental diseases and medications influence CNS is required. Studies to investigate the effect of MPV, anxiety disorder on CVDs and the effect of anxiety treatment on MPV should be carried out. 1. Kessler RC, Aguilar-Gaxiola S, Alonso J, Chatterji S, Lee S, Ormel J, et al. The global burden of mental disorders: an update from the WHO World Mental Health (WMH) surveys. Epidemiol Psichiatr Soc. 2009;18:23-33. 2. Vanhoutte PM. Platelet-derived serotonin, the endothelium, and cardiovascular disease. J Cardiovasc Pharmacol. 1991;17 Suppl 5:S6-12. 3. Lesch KP, Bengel D, Heils A, Sabol SZ, Greenberg BD, Petri S, et al. Association of anxiety-related traits with a polymorphism in the serotonin transporter gene regulatory region. Science. 1996;274(5292):1527-31. 4. Kang EH, Shim HB, Kim KJ, Park JE, Lee IS, Yu BH. Platelet serotonin transporter function after short-term paroxetine treatment in patients with panic disorder. Psychiatry Res. 2010;176:250-3. 5. Iny LJ, Pecknold J, Suranyi-Cadotte BE, Bernier B, Luthe L, Nair NP, et al. Studies of a neurochemical link between depression, anxiety, and stress from [3H]imipramine and [3H]paroxetine binding on human platelets. Biol Psychiatry. 1994;36:281-91. 6. Mercado CP, Kilic F. Molecular mechanisms of SERT in platelets: regulation of plasma serotonin levels. Mol Interv. 2010;10:231-41. 7. Markovitz JH, Matthews KA. Platelets and coronary heart disease: potential psychophysiologic mechanisms. Psychosom Med. 1991;53:643-68. 8. Huczek Z, Kochman J, Filipiak KJ, Horszczaruk GJ, Grabowski M, Piatkowski R, et al. Mean platelet volume on admission predicts impaired reperfusion and long-term mortality in acute myocardial infarction treated with primary percutaneous coronary intervention. J Am Coll Cardiol. 2005;46:284-90. 9. Göğçegöz Gül I, Eryılmaz G, Ozten E, Hızlı Sayar G. Decreased mean platelet volume in panic disorder. Neuropsychiatr Dis Treat. 2014;10:1665-9. 10. Camacho A, Dimsdale JE. Platelets and psychiatry: lessons learned from old and new studies. Psychosom Med. 2000;62:326-36. 11. Hamilton M. The assessment of anxiety states by rating. Br J Med Psychol. 1959;32:50-5. 12. Hamilton M. A rating scale for depression. J Neurol Neurosurg Psychiatry. 1960;23:56-62. 13. Noma A, Nakayama K. Polarographic method for rapid microdetermination of cholesterol with cholesterol esterase and cholesterol oxidase. Clin Chem. 1976;22:336-40. 14. Trinder P. Determination of blood glucose using an oxidase-peroxidase system with a non-carcinogenic chromogen. J Clin Pathol. 1969;22:158-61. 15. Burtis CA, Ashwood ER, Bruns DE, editors. Tietz textbook of clinical chemistry and molecular diagnosis. 5th ed. St. Louis, USA: Elsevier; 2012. 16. Cook EH Jr, Fletcher KE, Wainwright M, Marks N, Yan SY, Leventhal BL. Primary structure of the human platelet serotonin 5-HT2A receptor: identify with frontal cortex serotonin 5-HT2A receptor. J Neurochem. 1994;63:465-9. 17. Slavka G, Perkmann T, Haslacher H, Greisenegger S, Marsik C, Wagner OF, et al. Mean platelet volume may represent a predictive parameter for overall vascular mortality and ischemic heart disease. Arterioscler Thromb Vasc Biol. 2011;31:1215-8. 18. Jackson SR, Carter JM. Platelet volume: laboratory measurement and clinical application. Blood Rev. 1993;7:104-13. 19. Thompson CB, Love DG, Quinn PG, Valeri CR. Platelet size does not correlate with platelet age. Blood. 1983;62:487-94. 20. Glassman AH, Shapiro PA. Depression and the course of coronary artery disease. Am J Psychiatry. 1998;155:4-11. 21. Lambiase MJ, Kubzansky LD, Thurston RC. Prospective study of anxiety and incident stroke. Stroke. 2014;45:438-43. 22. Zafar MU, Paz-Yepes M, Shimbo D, Vilahur G, Burg MM, Chaplin W, et al. Anxiety is a better predictor of platelet reactivity in coronary artery disease patients than depression. Eur Heart J. 2010;31:1573-82. 23. Kokacya MH, Copoglu US, Kivrak Y, Ari M, Sahpolat M, Ulutas KT. Increased mean platelet volume in patients with panic disorder. Neuropsychiatr Dis Treat. 2015;11:2629-33. 24. Strike PC, Steptoe A. Psychosocial factors in the development of coronary artery disease. Prog Cardiovasc Dis. 2004;46:337-47. 25. Vizioli L, Muscari S, Muscari A. The relationship of mean platelet volume with the risk and prognosis of cardiovascular diseases. Int J Clin Pract. 2009;63:1509-15. 26. Hjemdahl P, Larsson PT, Wallén NH. Effects of stress and beta-blockade on platelet function. Circulation. 1991;84(6 Suppl):VI44-61. 27. Thompson CB, Jakubowski JA. The pathophysiology and clinical relevance of platelet heterogeneity. Blood. 1988;72:1-8. 28. Parakh K, Sakhuja A, Bhat U, Ziegelstein RC. Platelet function in patients with depression. South Med J. 2008;101:612-7. 29. Aschbacher K, Mills PJ, von Känel R, Hong S, Mausbach BT, Roepke SK, et al. Effects of depressive and anxious symptoms on norepinephrine and platelet P-selectin responses to acute psychological stress among elderly caregivers. Brain Behav Immun. 2008;22:493-502. 30. Greisenegger S, Endler G, Hsieh K, Tentschert S, Mannhalter C, Lalouschek W. Is elevated mean platelet volume associated with a worse outcome in patients with acute ischemic cerebrovascular events? Stroke. 2004;35:1688-91. 31. Lesch KP, Wolozin BL, Murphy DL, Reiderer P. Primary structure of the human platelet serotonin uptake site: identity with the brain serotonin transporter. J Neurochem. 1993;60:2319-22. 32. Markovitz JH, Shuster JL, Chitwood WS, May RS, Tolbert LC. Platelet activation in depression and effects of sertraline treatment: an open-label study. Am J Psychiatry. 2000;157:1006-8. 33. Serebruany VL, Gurbel PA, O’Connor CM. Platelet inhibition by sertraline and N-desmethylsertraline: a possible missing link between depression, coronary events, and mortality benefits of selective serotonin reuptake inhibitors. Pharmacol Res. 2001;43:453-62. 34. Martin JF, Shaw T, Heggie J, Penington DG. Measurement of the density of human platelets and its relationship to volume. Br J Haematol. 1983;54:337-52. 35. Kamath S, Blann AD, Lip GY. Platelet activation: assessment and quantification. Eur Heart J. 2001;22:1561-71. 36. Otahbachi M, Simoni J, Simoni G, Moeller JF, Cevik C, Meyerrose GE, et al. Gender differences in platelet aggregation in healthy individuals. J Thromb Thrombolysis. 2010;30:184-91.